Remotely located in Maputaland, the north-eastern province of KwaZulu Natal, South Africa, contiguous to the Mozambique border, Tembe Elephant Park is one of the largest and most popular national elephant reserves in South Africa. 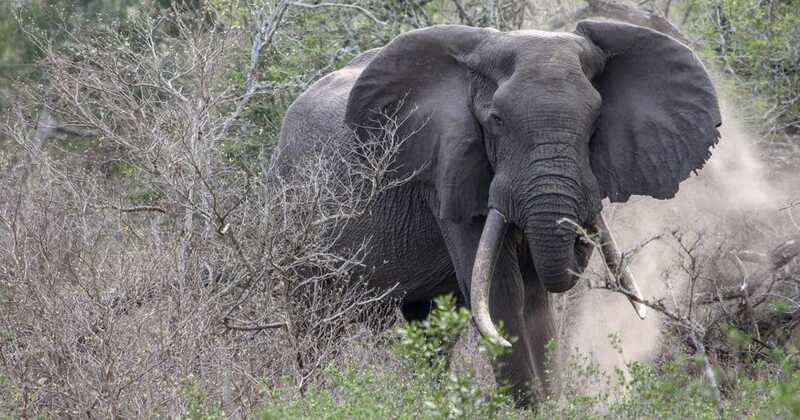 The park was established in 1983 to guard the last remaining herds of free-ranging elephants in South Africa which used to migrate between Maputaland and southern Mozambique. These elephants were traumatized by poaching during the civil war in Mozambique so the park was only opened to the public in 1991. Because of its differing terrains, Tembe Park supports a diverse mix of tropical and sub-tropical vegetation as it falls in a transitional area. Vegetation ranges from a dense sand forest, woodlands, grasslands, and swamplands, all of which combine to provide an ideal habitat that enables game-drive vehicles with perfect visibility to spot the elephants as well as the other animals, bird and insect species sheltered here. Elephants, rhinos, buffalos are the main wildlife attraction of the Park. Hippos, wildebeests, elands, zebras, giraffes, jackals, hyenas, waterbucks, reedbucks, nyalas, servals, kudus, warthogs, red duikers and other small mammals also thrive in abundance. Safari visitors to the Park cannot miss a glimpse of the rare and elusive Suni antelope, one of the smallest and shyest species of buck in southern Africa. Other endemic groups include 14 mammals, 23 reptiles, 3 frog species and 8 water fishes. Tembe Park is another highlight amongst birding enthusiasts in South Africa. Its assorted scrub, thornveld and sand forest offers perfect shelters a rich abundance of unique bird species. Over 340 bird varieties, many of which are endemic to South Africa or tropical zones have been recorded here including the rare Plain-backed Sunbird, Natal Nightjar, African Broadbill, also rare Rudd’s Apalis, Rufous-bellied Heron, and Woodward’s batis. Other common sightings are Woolly-necked Stork, Little Bittern, Sharp-billed Honeyguide, Hamerkop, Saddlebilled Stork, White Stork, Woodpecker, Bearded Woodpecker, African Broadbill, Golden-tailed Woodpecker, Yellow-billed Stork, etc. From Durban, take the N2 north towards Mkuze, about 350km away. Continue north on the N2, and join Jozini road after about 14km, and drive another 20km to Jozini. You will come across the dam wall but drive on for a further 72km – until you see the signpost of the Park entrance from where you’ll be picked up by a safari guide in a 4WD upon clearing the entrance fee. The best time to visit is from April to September. This is when the weather relatively very pleasant. Game safaris are best during the hot midday times as the elephants congregate around the waterholes. Guided Game Drives; Daytime and evening game drives are conducted by an experienced guide and are included at no extra cost. Elephant safaris are another option although not so popular. Snorkeling & Scuba diving for instance nearby Tongoland reefs. Turtle watching along the coast from Kosi to Ponte de Oro. Tembe safari camp is nestled in the tangled forests of the Park, on the border with Mozambique, and astride ancient elephant migration routes. It comprises six luxury en-suite and four semi-luxury safari tents that blend unobtrusively with their natural surrounds and are tucked away in secluded areas around the camp. 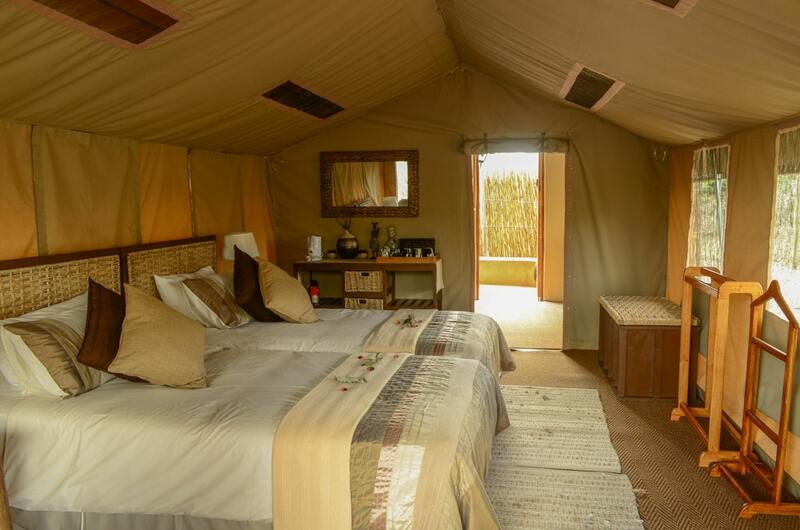 The tents are furnished and built on wooden platforms; each has both a queen size and a single bed. The Camp is privately managed and offers guided safaris in luxury open safari vehicles. There is an open-air braai area that lends itself to a rustic setting where guests can enjoy campfire meals under bright stars. It also has a Matriarch Suite, elevated on a wooden platform for special safari holidays.